Steam peeled daikon until tender, then purée. Add glutinous rice flour and water to mix to a smooth paste, seasoning with wasabi and salt. Shape and steam until set, then coat with toasted sesame seeds and chill. Brew Sencha tea as per package directions, then place in pot and bring to the boil. Add gellan, whisk well, pour onto flat tray and allow to set. Add shoyu to stock, bring to the boil, add gellan and set as above. Slice ginger into shape, and put into 120C oven to dry. 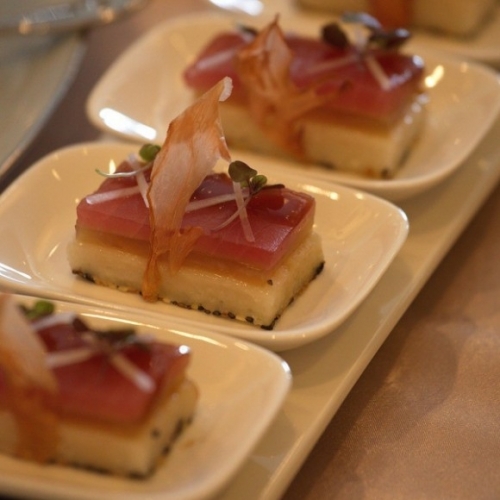 To assemble, lay tuna onto daikon pastry, lay Sencha jelly on tuna, and garnish with shoyu jelly and ginger.